Building a new home is a daunting task. The investment is large and no one wants to make a mistake that you end up living with day after day for many years to come. There will be things that you notice after you move in that you wish you had done differently. But as we do our best to plan our dream homes, we try to avoid these mistakes by learning from others. In my last two columns, I wrote about a visit my husband Mark and I made late last year to the home of Mark and Jasue Mix in Warsaw, Ohio. A veteran injured in Iraq who uses a wheelchair, Mark and his wife had their home built along universal design principals. I’ve already shared how the Mix’s experience gave us insights on how to build a better kitchen and laundry room. This month, let’s consider the living or great room, where so much of homelife is actually lived. The Mix kitchen has a vinyl floor with a transition strip at the edge of the carpeted great room. The transition into this room was very noticeable in my wheelchair because I had to use a lot more muscle to push my wheels across the thick padding and carpet. Mark told me that when he selected the carpet at the store he didn’t realize how hard it would be to roll on. When testing a carpet for its roll-ability, test it with the padding you plan to install. Mark gets fatigued going from room to room in his fully carpeted home and has made plans to remove all of the carpet, replacing it with hardwood floors. The hard surface of the hearth helps keep fireplace debris from falling on the carpet. Mark wished he had added additional tile on the flooring in front of the fireplace to keep sparks from burning the carpet. On the plus side, he had the hearth raised when it was built so he could reach it from a seated position. He can easily reach inside the fireplace with a long match to start the kindling wood. A gas flame that you can start with a remote is also a good solution. Mark instructed the builder to install all windows at a level so he could maximize his view of the backyard. The window sills are at the same height as the seat cushion of his wheelchair. He finds it easy to unlock the double hung windows and slide them up to open them. He can also tilt the windows inside to wash the outside of the windows. This is a big advantage! For my new home, I have selected Marvin Casemaster™ windows (www.marvin.com). I prefer operating this casement window with a crank handle instead of sliding the windows up and down. It’s easier on my back muscles and only takes one hand to operate. When I selected this window, I made sure that I could reach the lock lever from a seated position and that the handle was easy to operate. These windows come with crank, folding handles, or a powerdrive. When the electrician installed the electrical outlets in the Mix home, he placed them a little higher than normal at 18 inches above the floor so Mark could reach them easier. The light switches are also lower by a few inches—48 inches above the floor. Unfortunately the heating and air-conditioning installer placed the thermostat too high for Mark to reach. Eye level for a seated person is different for that of a standing person. Mark’s favorite place to watch television is in his recliner. He is able to use his arms to open the footrest and recline the chair. When planning the furniture arrangement for this room, Mark made sure that there was adequate clearance between the couch, tables, chairs, and television so that he could easily roll through the room. He also made sure that there was free space so he could park his wheelchair and enjoy conversations with guests. 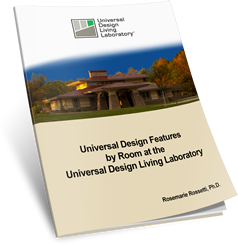 Designing a great room can be facilitated by examining the size of your current room and drawing the new room to scale on a sheet of paper. Position all furniture to scale and examine the circulation patterns for navigating in a wheelchair. Position the windows and doors to take advantage of the outdoor views. Select products that work best for you. 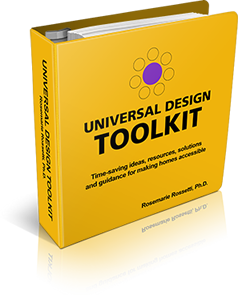 Share the universal design features with your builder and carefully supervise the building process.